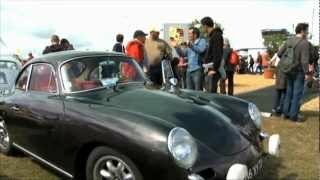 Classic car fans from all over the world met at Le Mans for the seventh time. Also making an appearance: numerous Porsche enthusiasts. A little over a month after the return of Porsche to the 24 Hours of Le Mans in the LMP1 class, another major event took place for motor racing fans at the race track on the Sarthe: the Le Mans Classic. 450 classic sports cars in six different age classes competed in a showdown on the Circuit de la Sarthe. Classic car auctions and award ceremonies were on the programme agenda of this multifaceted weekend, which took place for the seventh time. As close as Porsche's connection is to the history of Le Mans, it comes as no surprise that many of the fans of the Stuttgart-based sports car maker were among the participants and spectators alike. No less than around one thousand 911 vehicles were parked at the parking lot specially reserved for Porsche Club members. In total, Porsche welcomed more than 2000 guests in the pre-grid area. One of the highlights of the three-day event: the Porsche parade with the three museum vehicles – the 3.0 RSR, 935 and 936 – driven by racing legends and Le Mans winners Gérard Larrousse, Henri Pescarolo and Jürgen Barth.